Happy Monday, friends!! It's been so long since I last posted on the blog and sometimes you just need a few months off to think and get creative. When I first started A Small Town Fashionista I was in my senior year of college, living off that broke college student budget. I started this blog because I loved fashion and wanted to share affordable, everyday looks. I started discovering more and more highly successful fashion bloggers and noticed that I was always trying to compare myself to what they were doing. Like their Instagram has a theme so my Instagram needs a theme, they're doing this with their pictures so I should too, they own this so I should own that. I lost sight of the real reason I started this blog. I don't have money to update my wardrobe 24/7 and I know a lot of people don't either. I have friends say to me all the time, "looking at your blog makes me wish I wasn't so broke." Honestly, Tyler and I just put ourselves on a super tight budget so I haven't spent money on clothes in months. You don't need money to keep your wardrobe up to date and I have a lot of fun posts on this months blog schedule to share how you can turn one piece into multiple looks so you can look into your closet everyday thinking it's a new wardrobe. 1. Get Creative. This will definitely require you to get outside of your comfort zone. Don't be afraid to go for something you don't think looks right because chances are it does, it's just way out of your comfort zone. If you can't seem to get creative with your wardrobe, don't worry. I'm bringing a new series to the blog every Friday where I go through my entire wardrobe and share three ways I styled one specific piece. I just want to show you guys that having a new wardrobe without spending money is possible. 2. Don't exclude any pieces. Just because you always wear a certain shirt for work doesn't mean it always has to be a work shirt. I think this is where a lot of people get frustrated when they're trying to find something to wear. Next time you're in your closet don't label any clothes as 'work clothes' or 'lazy day clothes' and throw a couple looks together. You'll be surprised. 3. Once a week go through your wardrobe. Set aside an hour or two once a week to just go through your wardrobe. This will allow you to take your time (while saving you time) and be more creative because if you're anything like me you're rushing around in the morning trying to find something to wear. Pick out those pieces that you never wear anymore and create looks for the entire week or create multiple looks and put them to the side for the following week or if any last minute plans come up. 4. Just because it's old doesn't mean it's not good. This is something I would struggle with a lot because I was always so worried about being in trend. 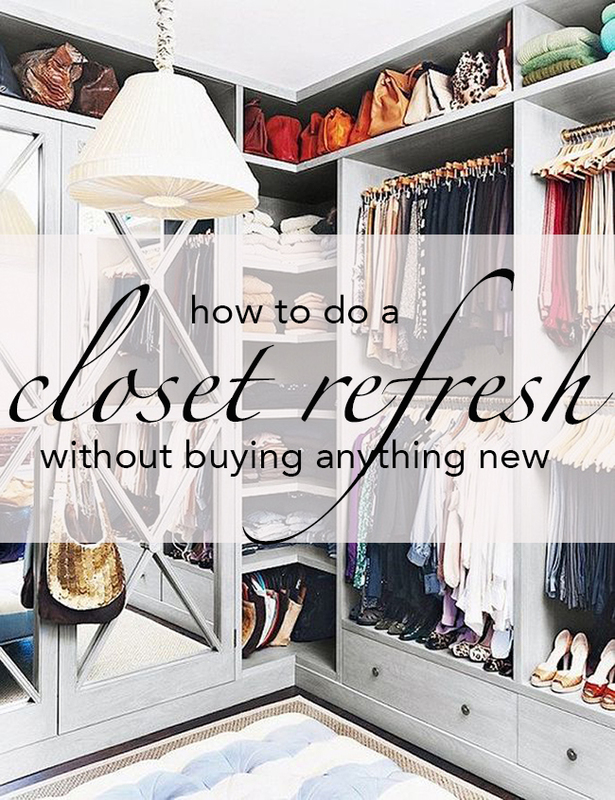 I would always go through my closet and put clothes in a bag to give away just because they were old or I wouldn't reach for certain items in my wardrobe because I purchased them years ago, but those are the best items in your wardrobe! While putting together looks for the blog I was digging through clothes I haven't worn in years and forgot just how much I loved them. If you're constantly trying to keep up with the trends you'll find yourself spending hours in looking into your closet. Starting this week with a new mindset for the blog and I'm so excited to share all of the affordable content I have scheduled! And if any of you girls use these tips before this weeks Refresh Friday share your outfit with me! As always, my inbox is always open if you need any advice.